The land that is now known as Canada was first home to many different nations of Indigenous peoples with distinctly different languages and social organizations. What they shared was a great ability to live with the land and it was only by copying Indigenous ideas like the snowshoe, birchbark canoes and pemmican: dried lean meatpemmican that the Europeans were able to survive the harsh winters and develop a vast fur trade that eventually spread European influence across the country. 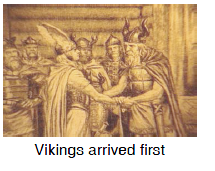 First, Eric the Red and Leif the Lucky brought Viking settlements to the island of Newfoundland. Then Cartier navigated up the St. Lawrence in 1535. 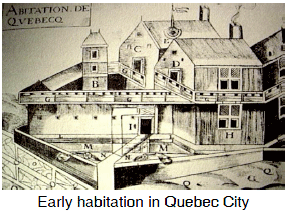 Finally Champlain established the first permanent European settlement on the St. Lawrence in 1608 on the site of what is now Quebec City. Early government in the settlement was under the control of the fur trading and settlement companies. Settlement was sparse and based on the seigneurial system: a feudal system of land ownership whereby huge grants put land ownership in the hands of seigneurs who rented sections to farmersseigneurial system. Then, in 1663 when the Sun King, Louis XIV, was young and newly ascended to the throne of France, when Molière: French dramatist and comic actor who lived from 1622-1673Molière was satirizing the French upper classes in his plays, Pepys: English diarist and naval administrator; lived from 1633-1703Pepys was recording details of the horrible Black Plague in his diary, and Descartes' ideas were the topic of dinner party conversations in Paris - this small snowbound outpost of New France was officially recognized as a Royal Colony. Guided by his clever first minister, Jean-Baptiste Colbert, Louis sent a Governor and an energetic Intendant: an important administrative official in New France, responsible for finance, justice and police in the colony. Jean Talon was the first.Intendant - Jean Talon - to run the colony and sit on its Sovereign Council. He also shipped a number of young women to Canada to make up for a shortage of eligible brides and encourage population growth in the colony. (See Les Filles du Roi).